Photo of Peter Sagan by the A.S.O. Peter Sagan took his second stage victory in this Tour de France, once again beating Sonny Colbrelli for the win in the town of Quimper. The world champion was always the top favorite to win this stage, even more so when most of his key rivals were dropped well before the finale. However, a powerful sprint was still required to beat the remaining opponents. "It was a bit lucky because (Sonny) Colbrelli was coming close again," the Bora-hansgrohe rider said. "My teammates did a very good job. From the middle of the stage they were pulling in the front. (Maciej) Bodnar, (Marcus) Burghardt and the other guys brought me into a good position for the final climb. "Then Sky just started to pull full gas and (Philippe) Gilbert tried to attack, but we caught him. Afterwards, (Greg) Van Avermaet I think started too early and in the end he pulled a very good sprint for me and Colbrelli." 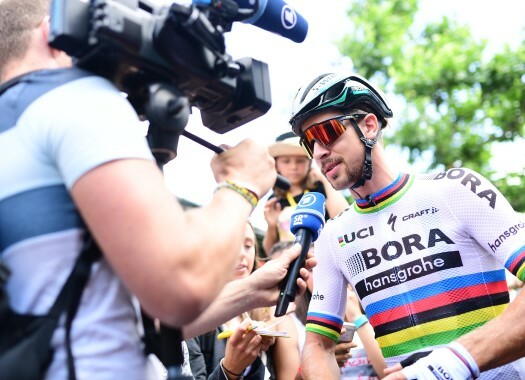 The course had more similarities with a classic race than with a Tour de France stage, although it's still difficult to compare the two according to Sagan. "We're in the Tour de France and everything is different. But the parcours was a bit hard, up and down, left and right, narrow roads. It was a little technical, it was a nice parcours." With this win, Sagan extends his lead in the Green Jersey classification but would have liked to get more points. "I think today we got less points than normal, just 30 I believe for the winner. But it's better than nothing. Tomorrow is another day."